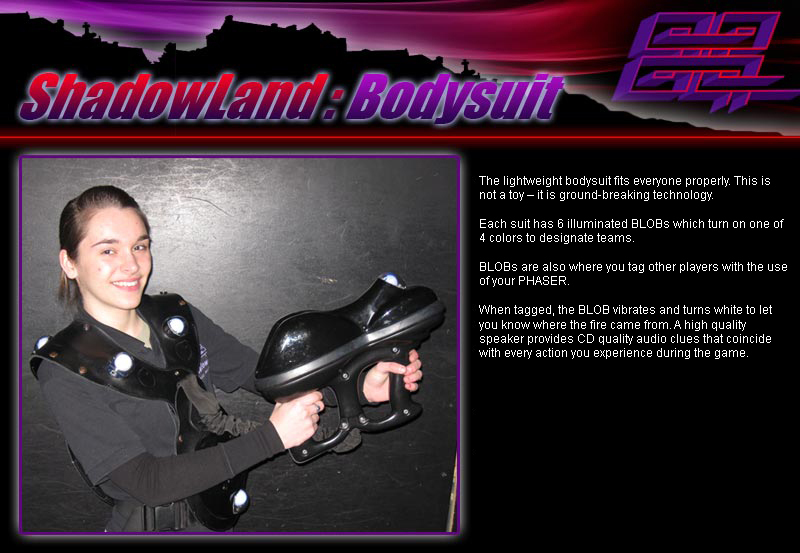 The lightweight bodysuit fits everyone properly. This is not a toy – it is ground-breaking technology. Each suit has 6 illuminated BLOBs which turn on one of 4 colors to designate teams. BLOBs are also where you tag other players with the use of your PHASER. When tagged, the BLOB vibrates and turns white to let you know where the fire came from. A high quality speaker provides CD quality audio clues that coincide with every action you experience during the game. The lightweight phaser is two-handed for comfort, accuracy and safety. It is remarkably accurate enabling you to pick off other players’ BLOBs from a great distance. 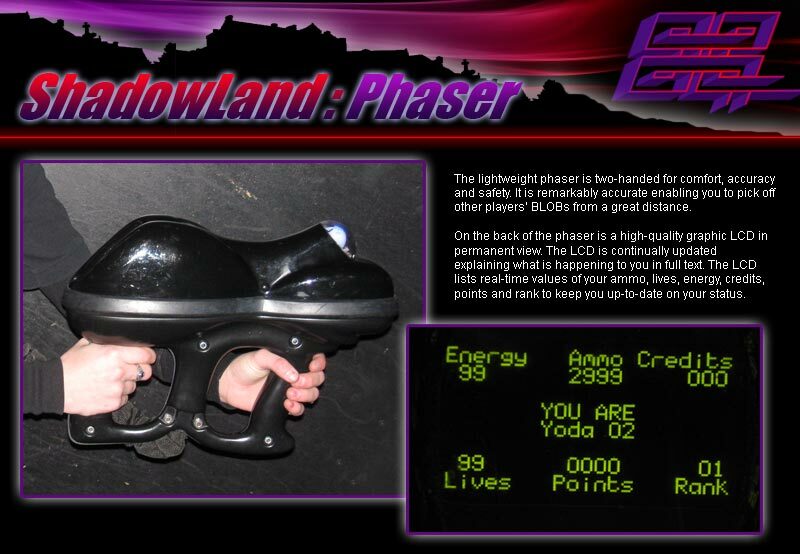 On the back of the phaser is a high-quality graphic LCD in permanent view. The LCD is continually updated explaining what is happening to you in full text. The LCD lists real-time values of your ammo, lives, energy, credits, points and rank to keep you up-to-date on your status. GEMs are found throughout the arena.They can help you – you can tag them to earn special powers to enhance your ability to play. GEMs can also attack you. When they sense you in their area they will tag you if you do not tag them first. GEMs can also act as energizers, team bases, sentinels, ammo dumps, mines or keys to advance further into an adventure. 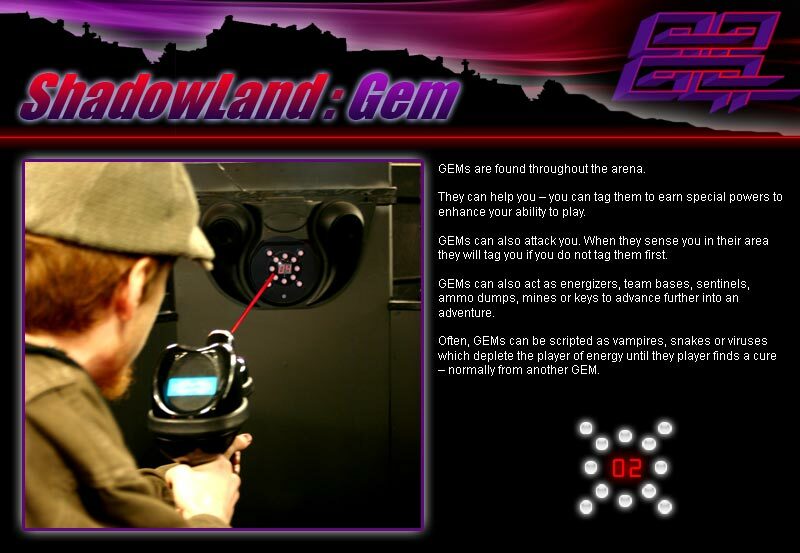 Often, GEMs can be scripted as vampires, snakes or viruses which deplete the player of energy until they player finds a cure – normally from another GEM.